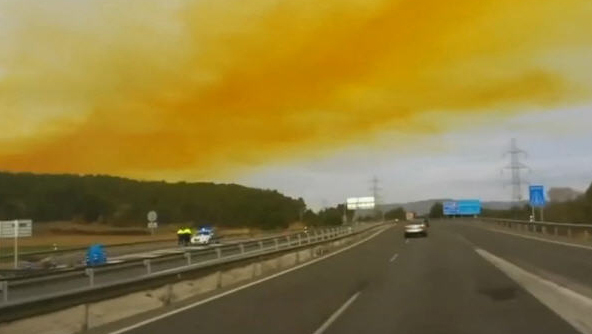 Major international news outlets are reporting that a hazardous materials explosion at a chemical plant in Spain has injured three people and resulted in an enormous orange cloud that is currently hanging over the outskirts of Barcelona. Officials are treating the cloud as potentially toxic. Spanish authorities have advised the over 60,000 residents in the immediate area to stay indoors. The facility where the chemical explosion happened is known to store and distribute hazardous chemicals. The government of Catalonia released a preliminary finding that the explosion was caused when two chemicals inadvertently came into contact. Later in the day, RT announced findings that the chemical mixing had occurred as result of a truck accident at the facility, which resulted in a fire.